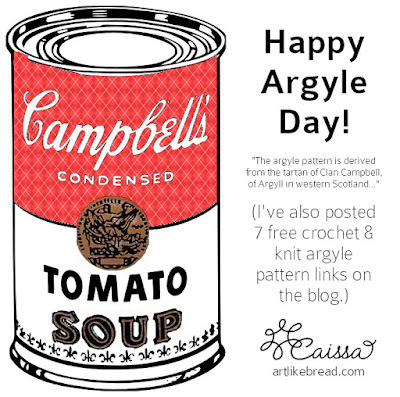 Art, Like Bread: 7 #Crochet & #Knit Argyle Patterns for #Argyle Day! 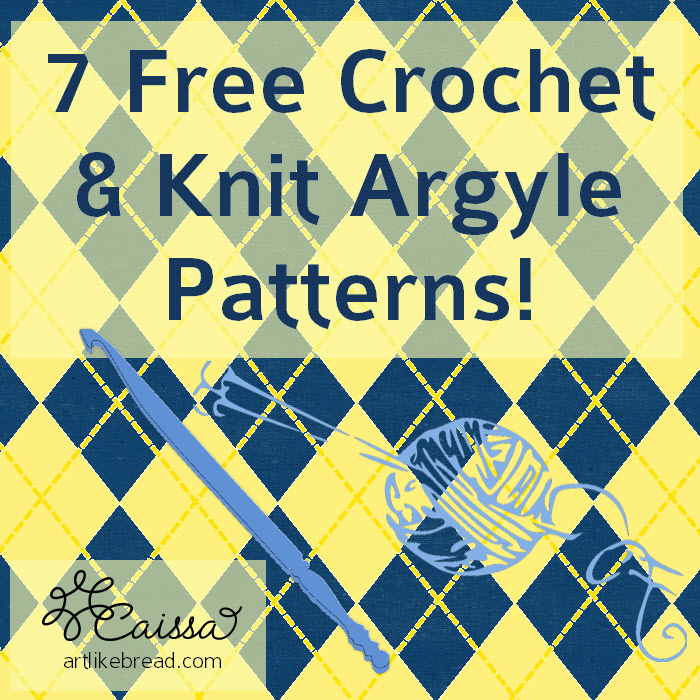 7 #Crochet & #Knit Argyle Patterns for #Argyle Day! Don't you just love random holidays? I found out about this one (and many others) on a blog called Holidays & Observances. No idea where this one originated, but to me, a textile pattern with its own day is a cause for celebration! 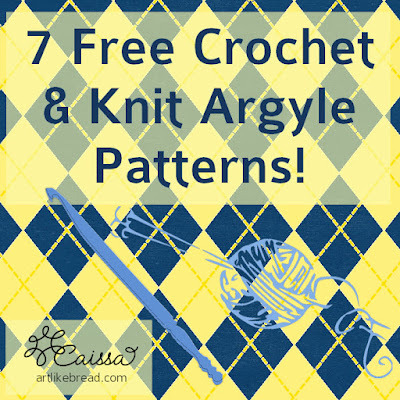 In honor of this happy day, I've rounded up 7 Free Crochet & Knit Argyle Pattens AND I have created a Pinterest Board devoted to Argyle Crafts! First is the Argyle Bean Bag Ottoman / Pouf by Yarn Twins for Red Heart North America. This is just super-adorable and it could be made in any colors! For a simpler project, try the Simple Argyle Scarf by Tricia Mae Keffer. It's so cute! 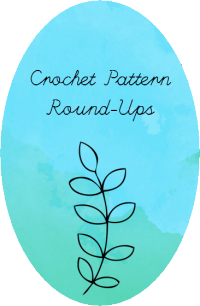 Although it's a Machine Knitting pattern, it's also a chart you could use to do crochet colorwork. The 12-Stitch MK Argyle by Jeanne Helfrich was published in Goats and Hounds and is available as a free Ravelry download. Damascena by Bethany Axtman was in Knitty, First Fall 2015, so you know it's a great pattern! Double Diamond Argyle Hat by Cheryl Burke for Yarnbee is a cute, knitted beanie for anyone in the family. Dapper Dame Fingerless Mitts by Sharon Moore for Deep Roots Dance is a cute (and it looks like a quick) way to practice your knitting colorwork. Intermediate Bag of Tricks by Tracy Leming is an adorable clutch pattern designed for people who want to learn double knitting. 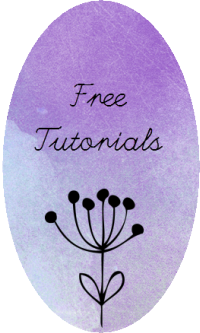 You might know that I crochet a lot more than I knit, but that intermediate bag of tricks looks really cute. I may try it (or replicate it in crochet)! 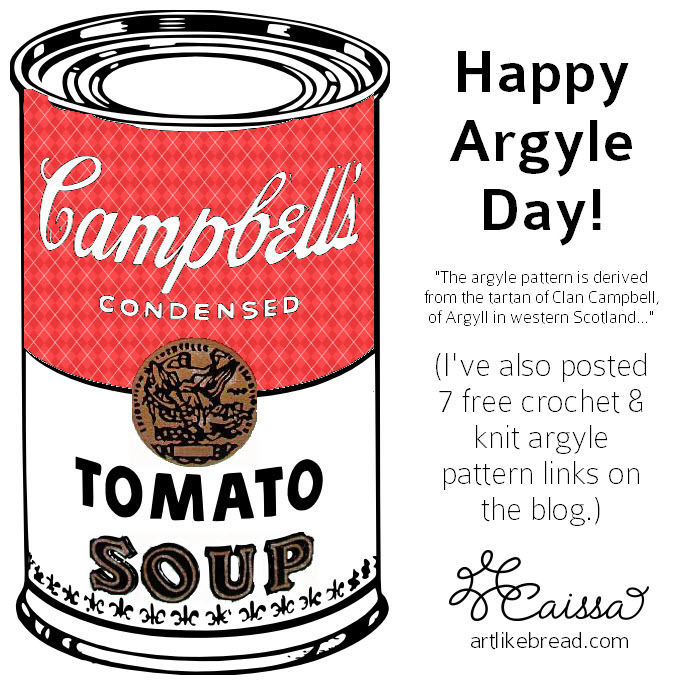 What will you do to celebrate Argyle Day? Please leave your thoughts, ideas and questions in the comment section below. As always, thanks for reading the blog! 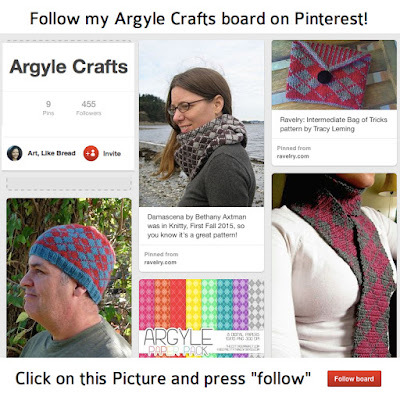 If you liked my argyle roundup, please share this post with a friend through social media & craft your argyle with pride! Like my Facebook page for updates and more crafty sharing!